Bright Light is a chunky mix of neon glitters. Definitely fun and very 80s! I have shown one coat here over Zoya Purity. The big glitters can be tricky to grab with the brush, so definitely flip it upside down for a few minutes before applying to make it easier. Diamond Dusted is a gorgeous iridescent glitter topper with squares, hexes, and smaller glitter pieces. It really shines over dark colors, so I've shown it over Cult Nails Time Traveler. The glitter was plentiful and applied evenly without difficulty. Sea Glass is a teal shredded glitter topper. The shreds in this polish are larger than any of the other shredded toppers I've tried, but having said that, I didn't run into any troubles with pieces sticking up off the nail. The pieces are super reflective and give a very pretty effect. Shown over OPI Ski Teal We Drop. Space Candy may be my favorite of the bunch! This glitter topper has an abundance of bright pink and blue glitters mixed in with lots of holographic silver glitter. It applied beautifully and was so sparkly. Shown here is one coat over Duri Into the Further. Strawberry Donut...mmm. Now I'm hungry! This sweet pink semi-opaque base is sprinkled with a rainbow of small glitters and a few medium sized pieces here and there. The formula on this was lovely, needing just two coats for the opacity shown. It was nice and smooth, no streaks. We're All Mad Here is another one of my favorites. How lovely does it look with Julep Taylor? This pink, black, and silver glitter topper has stars, squares, hexes, and dots (though I didn't end up with any of the dots in my swatch). Zombie Blood is an all-green mix of lime and chartreuse. To make the lighter greens pop, I chose to layer it over OPI Jade is the New Black. This polish gives a kind of fizzy, carbonated effect, almost like Mountain Dew! Aren't these glitters fun? If you want to try the brand out for yourself, test your luck via the giveaway below or shop the brand at Starrily.com. There is a special running right now for 30% off, so enter "zoinks" at checkout to claim your discount! You can also follow Starrily on Facebook, Twitter, and Instagram. Thank you so much to Starrily for providing the prizes for this giveaway! Please enter using the Rafflecopter widget below. Must be a follower of Chalkboard Nails to win. Must be 18 years of age or older, or you must have your parent's permission to enter. This giveaway is open internationally, and closes on October 15, 2013. The winner will have 48 hours to claim their prize, after which a new winner will be chosen. I love Sea Glass, it looks amazing over that teal. 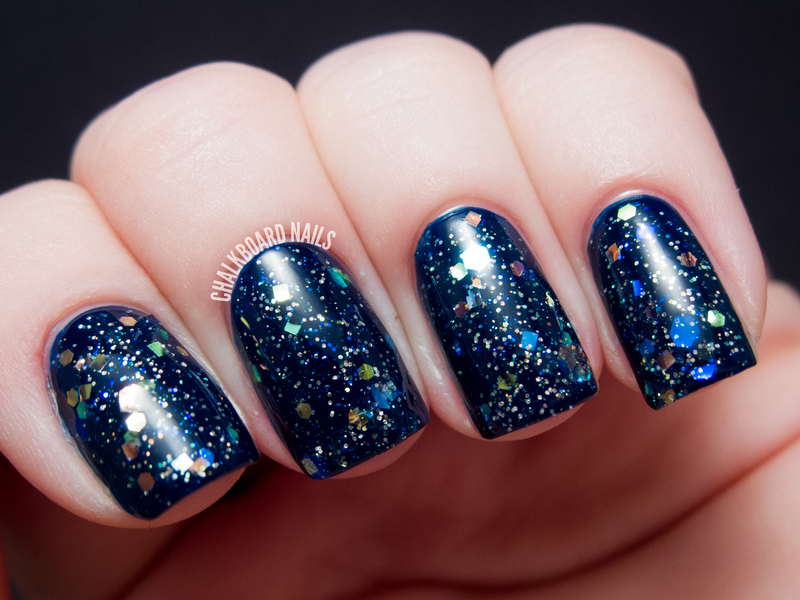 I need sea glass and space candy in my life! Thank you for swatches! I've always been kind of interested in this brand but I haven't seen many swatches of their polishes. I love Space Candy, Zombie Blood, and We're All Mad Here! Whoa Sea Glass looks amazing!! I've never seen anything like it! Great pairing combo as well.. it looks unreal! I think they look good all of them but Zombie Blood is awesome! Wooooooowwww!!! I ♥ Bright Light and I also like We're All Mad Here :D Thanks for this great giveaway!!! I really like We're All Mad Here - very cute! Beautiful swatches! Love them all. These polishes all look so fun! Bright Light is amazing! Thanks for Swatches!!! Just loved each bottle....colors are very gorgeous...simply amazing... !!! !